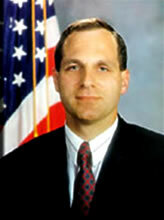 Before his car drifted across the road and crashed last week, former FBI Director Louis Freeh likely fell asleep and won’t be cited. ABC News reports that Freeh can’t recall why his car crashed in Barnard, VT.
Investigators said they won’t know for sure what caused the accident, but evidence points to him falling asleep. Drugs and alcohol were not a factor, investigators said. No brake or swerve marks were spotted on the road. Freeh, 64, was seriously injured in the crash and was airlifted to Dartmouth-Hitchcock Medical Center in Lebanon, New Hampshire. The hospital declined to release his condition Wednesday. Posted: 9/4/14 at 8:46 AM under FBI, News Story.